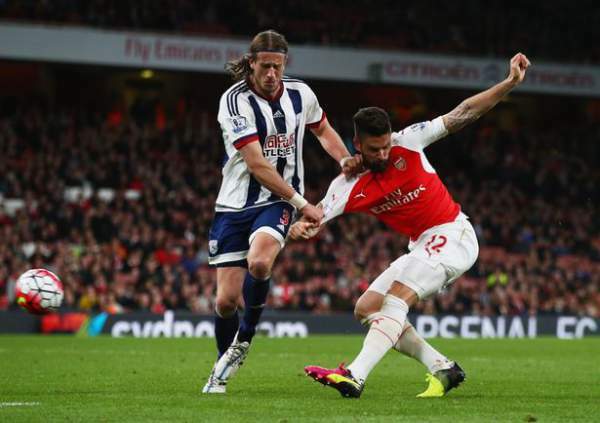 West Bromwich Albion vs Arsenal Live Streaming EPL Score WBA v ARS: Today we have the 29th match day of the Premier League, and it is West Brom Albion hosting Arsenal at the Hawthorns for the game. West Brom Albion is currently eight on the table with 40 points from 28 matches, seven points below Everton and four points above Stoke City. On the other hand, we have Arsenal who is fifth on the table with 50 points from 26 games, five points below Liverpool and one point above Manchester United. 18th March 2017 at 18:00 (IST). The Hawthorns, West Bromwich, England. West Bromwich is currently eight on the table with 11 wins, seven draws and ten losses from 28 games they have played in the league, scoring 36 goals and conceding 37 goals in total. Solomon Rondon is their top scorer in the league with seven goals to his name. West Brom Albion has lost two games, drew two and won two games in their last six games of the league. They played against Everton in their previous game of the league and lost the game by 0-3 at home. Tony Pullis won against Arsenal in this exact fixture last season and would be hoping tp do it again, although he has lost six and drew two in the last nine games, winning one. Arsenal is currently fifth on the table but has played two games less than several other teams. They have won 15 games, drew five and lost six games in total, scoring 55 goals and conceding 31 goals in total. Arsenal have lost three out of their last four games in the league, the same number of losses as they have suffered in their previous 32 games in the league. Alexis Sanchez has been involved in 26 league goals this season, 17 goals and nine assists. Arsenal is very strong, but there hasn’t been the best lately so anything can happen here.